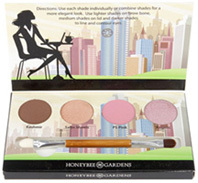 Gift Sets, Travel Kits: Honeybee Gardens, Weleda, Andalou, Devita! 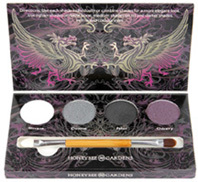 • Mineral Eye Shadow Kit Rock the Smokey Eye: Simply, these colors are definite to leave an impression. The smokey eye can transform anyone's look from plain Jane to glamorous diva. But watch out! These perfectly paired shades might cause paparazzi frenzy. This four shade collection comes in a recyclable, magnetic palette and includes a dual end sponge/brush bamboo applicator which is eco-friendly and cruelty free. Gluten free. 4 shadows at 1.3 g/0.045 oz. each. Made in USA. ORDER NOW! Ingredients: Mica, Kaolin, Boron Nitride, Magnesium Carbonate, Zinc Stearate, Squalane, Polyglyceryl-3 Diisosterate, Sodium Dehydroacetate, Ethylhexyl Palmitate, Aloe Barbadensis Leaf Extract, Cucumis Sativus (Cucumber) Fruit Extract, Anthemis Nobilis (Roman Chamonile) Flower Extact, Tocopheryl Acetate. May Contain: Titanium Dioxde, Iron Oxides (CI 77491, 77492, 77499), Ultramarines, Chromium Hydroxide Green (CI 77289), Chromium Oxide Greens (CI77288), Manganese Violet (CI 77742) Carmine, Tin Oxide, Silica. • Mineral Eye Shadow Kit Cosmopolitan: You accomplish it all: encounter the boys in the boardroom by day, domestic goddess duty by night. Nothing slows you down. Overcome your day with elegance and style. These neutral eye shadows will make certain that you always look polished. Play with the mixture of textures to give you a natural glow or a refined diva look. This four shade collection comes in a recyclable, magnetic palette and includes a dual end sponge/brush bamboo applicator which is eco-friendly and cruelty free. Gluten free. 4 shadows at 1.3 g/0.045 oz. each. Made in USA. ORDER NOW! Ingredients: Mica, Kaolin, Boron Nitride, Magnesium Carbonate, Zinc Stearate, Squalane, Polyglyceryl-3 Dilisostearate, Sodium Dehydroacetate, Ethylhexyl Palmitate, Aloe Barbadensis Leaf Extract, Cucumis Sativus (Cucumber) Fruit Extract, Anthemis Nobilils (Roman Chamomile) Flower Extract, Tocopheryl Acetate. May Contain: Titanium Dioxide, Iron Oxides (CI 77491, 77499), Ultramarines, Chromium Hydroxide Green (CI 77289), Chromium Oxide Greens (CI 77288), Manganese Violet (CI 77742), Carmine, Tin Oxide, Silica. 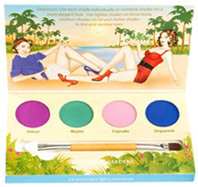 • Mineral Eye Shadow Kit Party Girl: Party girls never take life too seriously. Life's a beach, so celebrate in bold, trendy style. The pigment-rich palette of vivid shades will turn any shrinking violet into a stunning beauty. Bee the life of the party! This four shade collection comes in a recyclable, magnetic palette and includes a dual end sponge/brush bamboo applicator which is eco-friendly and cruelty free. Gluten free. 4 shadows at 1.3 g/0.045 oz. each. Made in USA. ORDER NOW! Ingredients: Mica, Kaolin, Boron Nitride, Magnesium Carbonate, Zinc Stearate, Squalane, Polyglyceryl-3 Diisostearate, Sodium Dehydroacetate, Ethylhexyl Palmitate, Aloe Barbadensis Leaf Extract, Cucumis Sativus (Cucumber) Fruit Extract, Anthemis Nobilis (Roman Chamomile) Flower Extract, Tocopheryl Acetate. May Contain: Titanium Dioxide, Iron Oxides (CI 77491, 77492, 77499), Ultramarines, Chromium Hydroxide Green (CI 77289), Chromium Oxide Greens (CI77288), Manganese Violet (CI 77742), Carmine, Tin Oxide, Silica. • Body Oil Starter Kit: To get you started we've put together a handy sized sample of our luscious body oils. Whether you have dry skin, need a soothing or pampering massage, want to recondition your skin's vitality or just gratify your senses, this is the kit for you. 6 pc. ORDER TODAY! -- 1 Birch Cellulite Oil: Cellulite gets visibly toned down after just one month with this revitalizing oil. 0.34 oz. -- 1 Arnica Massage Oil: Tired, aching muscles get immediate relief with this nourishing oil. It's a soothing natural beauty treatment that deeply nourishes your skin as your body and mind relax. 0.34 oz. -- 1 Lavender Relaxing Body Oil: It's a calming blend that restores essential moisture balance to soften your skin and melt away the stresses of your day. 0.34 oz. -- 1 Wild Rose Body Oil: Deserving skin finds indulgent renewal and radiant beauty with this luxurious body oil. It's a full-body pampering with the most precious extract for rich moisture and a nourished glow. 0.34 oz. -- 1 Sea Buckthorn Body Oil: It's a replenishing full-body treatment packed with antioxidants and vitamins to nurture and protect your skin's radiant health, particularly after exposure to the sun. 0.34 oz. -- 1 Pomegranate Regenerating Body Oil: This natural oil moisturizer helps revitalizes aging and tired skin, regulates moisture balance, and restores your natural vitality with potent antioxidants. 0.34 oz. • Calendula Baby Starter Kit: The Weleda Baby Starter Kit is a carefully formulated collection for the care of the delicate skin of your baby, child and your own sensitive adult skin. Provides your baby's skin soft and smooth, wrapping your child in a layer of warmth and protection. This selection of the Calendula Baby Care products makes a perfect natural baby gift for new parents, is ideal for travel or last-minute sleepovers and comes in a handy reusable zipper bag. Our Weleda Baby Starter Kit is everything you need to completely care for your precious baby. -- 1 Calendula Shampoo and Body Wash: A gentle wash that retains the moisture in your baby's hair and skin, leaving it feeling silky smooth and protected from drying out. 0.68 oz. -- 1 Calendula Diaper Care: Gentle, effective relief and protection for delicate skin that's tender from a distressing diaper rash. 0.4 oz. -- 1 Calendula Baby Cream: A rich, protective cream, made with organic calendula and chamomile that intensively nourishes dry areas of baby's skin. 0.34 oz. -- 1 Calendula Lotion: This light, nourishing and all-natural body lotion is ideal for every day use to keep your baby's skin healthy and soft from head-to-toe. 0.34 oz. -- 1 Calendula Face Cream: A gentle, moisturizing facial cream supports skin's natural functions and keeps your baby's facial skin feeling soft and smooth. 0.32 oz. • Indulgent Body Lotion Kit: Body Lotion Starter Kit is a convenient way to sample each our indulgent body lotions-and they are ideal for travelling. Each formulation is well-known by its complete approach to invigorating and stimulating the body, mind and soul to attain inner balance and increase your own natural beauty. 4 pc. ORDER TODAY! -- 1 Citrus Hydrating Body Lotion: The light-weight Citrus Hydrating Body Lotion for normal skin leaves skin with a long-lasting feeling of refreshment. 0.68 oz. -- 1 Sea Buckthorn Replenishing Body Lotion: Protects dry skin from moisture loss, activates your skin's self-regulating functions and leaves you with lasting replenishment and renewed vitality. 0.68 oz. -- 1 Wild Rose Pampering Body Lotion: The silky Wild Rose Pampering Body Lotion for normal to dry skin stimulates your skin's regenerative processes and helps maintain its natural elasticity. 0.68 oz. -- 1 Pomegranate Regenerating Body Lotion: The rich Pomegranate Regenerating Body Lotion for maturing skin actively prevents premature aging, helps skin regain firmness and leaves you feeling velvety smooth. 0.68 oz. • Winter Essentials Kit: Winter Essentials Kit features two Weleda favorites, Skin Food and Everon Lip Balm, to heal dry, rough skin from head to toe. Made with powerful, natural ingredients like organic Pansy, Calendula and Chamomile, Skin Food calms and replenishes, leaving skin healthy, soft and revitalized. All-natural Everon Lip Balm nourishes and protects lips in need of deeply hydrated relief. Blended with organic Jojoba Seed Oil, organic Shea Butter and Beeswax, it reduces dryness for a healthy, nurtured smile that is certain to revive spirits this holiday season. 2 pc. ORDER TODA! -- 1 Skin Food, 1.0 oz. -- 1 Everon Lip Balm, 0.17 oz. Ingredients: Viola Tricolor (Pansy) Extract, Cera Flava (Beeswax), Shea (Butyrospermum Parkii). 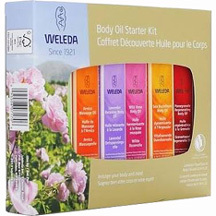 SETS & KITS: Body Oil Starter Kit, 6 pc. SETS & KITS: Calendula Baby Starter Kit, 5 pc. 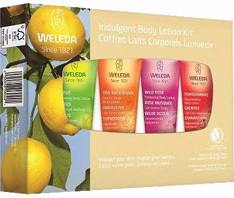 SETS & KITS: Indulgent Body Lotion Kit, 4 pc. SETS & KITS: Winter Essentials Kit, 2 pc. 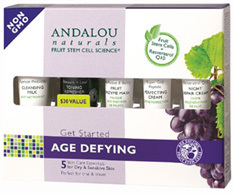 • Get Started Kit Age Defying: Made with Fruit Stem Cell Science renews skin at the cellular level, combining nature and knowledge for visible Age Defying results. 5 skin care essentials for Dry & Sensitive Skin. Perfect for trial & travel. 5 pc. ORDER TODAY! -- 1 Apricot Probiotic Cleansing Milk: Gently loosen and remove make-up and impurities, while restoring intracellular moisture and a healthy glow. 0.8 oz. -- 1 BioActive 8 Berry Fruit Enzyme Mask: Helps slow cellular damage, stimulate skin firming collagen and elastin, and gently dissolve dull, dry surface cells to reveal skin's vitality and ageless beauty. 0.5 oz. -- 1 Blossom + Leaf Toning Refresher: Helps protect, hydrate, and replenish essential nutrients, soothing irritation and balancing skin's delicate pH, and refresh for a healthy glow. -- 1 Super Goji Peptide Perfecting Cream: Helps boost cellular repair and renewal, dramatically transforming to firmer, brighter, younger-looking skin with fewer fine lines and wrinkles. 0.4 oz. -- 1 Resveratrol Q10 Night Repair Cream: Helps stimulate circulation, slow cellular damage, improved dermal texture, diminishing fine lines and wrinkles overnight for smooth, ageless beauty. 0.4 oz. • Get Started Kit Brightening: Formulated with Fruit Stem Cell Science renews skin at the cellular level, blending nature and knowledge for visible Brightening results. 5 skin care essentials for Normal & Combination Skin. Perfect for trial and travel. 5 pc. ORDER TODAY! -- 1 Meyer Lemon Creamy Cleanser: Helps lift away impurities, and stimulate circulation for improved clarity, tone, and texture. 0.8 oz. -- 1 Pumpkin Honey Glycolic Mask: Gently dissolve and lift away dull surface cells, exfoliating and resurfacing for even tone and smooth texture, and helps revitalize for a brighter, more luminous complexion. 0.8 oz. -- 1 Clementine + C Illuminating Toner: Helps improve skin tone and texture, hydrates and oxygenates, balancing pH, and stimulate circulation for healthy luminosity. 0.1 oz. -- 1 Probiotic + C Renewal Cream: Helps slow cellular damage, stimulating circulation, and healthy cell renewal, diminishing dark spots and discoloration for even skin tone. 0.4 oz. -- 1 Purple Carrot + C Luminous Night Cream: Helps defend against UV damage and premature aging by activating cellular renewal, for even tone, firmer texture, and a healthy, luminous complexion. 0.4 oz. • Get Started Kit Clarifying: Formulated with Fruit Stem Cell Science renews skin at the cellular level, blending nature and knowledge for visible Clarifying results. 5 skin care essentials for Active & Oily Skin. Perfect for trial & travel. 5 pc. ORDER TODAY! -- 1 Citrus Kombucha Cleansing Gel: Helps whisk away excess oil, maintaining a healthy moisture barrier for clean, clear skin. Gentle and non-drying, for a healthy complexion. 0.8 oz. -- 1 Kombucha Enzyme Exfoliating Peel: Helps loosen and exfoliate dull, dry surface cells, unclogging pores and stimulating circulation for improved clarity, tone, and texture for a clear, refreshed complexion. 0.5 oz. -- 1 Aloe + Willow Bark Pore Minimizer: Helps remove dull skin cells, debris, and excess oil that can clog pores and increase breakouts. Purifies, refines, and gently exfoliates to reduce the appearance of enlarged pores for a tighter, smoother, cleaner complexion. 0.1 oz. -- 1 Acai + White Tea Oil-Free Moisturizer: Helps slow cellular damage and stimulate healthy cell renewal for a revitalized complexion. 0.4 oz. -- 1 Beta Hydroxy Complex Recovery Cream: Works overnight to speed healing, helps clarify and minimize pores, curbs bacteria, and balances excess oil; oxygenates, hydrates, and calms inflammation. Skin awakes feeling hydrated, repaired, and replenished. 0.4 oz. Get Started Age Defying Kit, 5 pc. Get Started Brightening Kit, 5 pc. Get Started Clarifying Kit, 5 pc. SETS & KITS: Getting Started Kit, 5 pc. • Holiday Gift Set (Bodywash & Lotion) Candy Cane: Pamper in Candy Cane delight with this luxuriant all natural lathering Body Wash and skin quenching Lotion. Enjoy stimulating Mint with exciting aromas of Raspberries and Cherries while you cleanse your skin to the harmony of the well-known Candy Cane experience we all love. 2 pc. Two 16 oz. bottles. Made in USA. ORDER NOW! Ingredients: Purified water, aloe barbadensis leaf juice, sodium lauroamphoacetate, cocamidopropyl betaine, decyl glucoside, lauric diethanolamide, sodium chloride, calendula officinalis flower extract, chamomilla recutita (matricaria) flower extract, pyrus malus (apple peel) extract, cinnamomum zeylanicum (cinnamon) leaf oil, bisabolol, panthenol, tocopheryl acetate, potassium sorbate, sodium benzoate, natural botanical fragrance blend. • Holiday Gift Set (Bodywash & Lotion) Apple Cinnamon: Delight yourself to warm Apples and Cinnamon spices with this all natural duo of splendid lathering Body Wash and skin quenching Lotion. Stimulate your skins natural tones with refreshing Apple nutrients while you take in the warm rich scents of Cinnamon, leaving you feeling warm and comfortable. 2 pc. Two 16 oz. bottles. Made in USA. ORDER NOW! Ingredients: Purified water, aloe barbadensis leaf juice, cetearyl alcohol (coconut derived), emulsifying wax, dimethicone, ceteareth-5 (coconut oil derived), acerola (cherry) extract, rubus idaeus (red raspberry) extract, calendula officinalis flower extract, chamomilla recutita (matricaria) flower extract, mentha piperita (peppermint) leaf oil, bisalolol, panthenol, tocopheryl acetate, potassium sorbate, sodium benzoate, natural botanical fragrance blend. 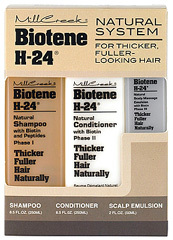 Biotene H-24 Tri-Pak Complete Biotin Treatment System: Biotin and Panthenol, the foundation of Biotene H-24 products are key factors in healthy fuller-looking hair. Biotene H-24 has developed a unique easy-to-follow system utilizing Biotin in a precise combination with other important natural ingredients. These special formulas work remarkably well to help give your hair fullness, strength and body. • Biotene H-24 Scalp Massage Emulsion 2.0 oz. (Potent emulsion helps energize hair and scalp and leaves hair stronger and full of body). Biotene H-24 Tri-Pak, 3 pc. SETS & KITS: Bodywash & Lotion Gift Set, 2 pc. SETS & KITS: Biotene H-24 Tri-Pak, 3 pc. • Flight Attendant First Class Travel Kit Tea Tree & Cucumber Song: Beauty and hygiene on the go for head to toe! 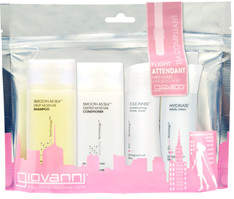 Packing just got a whole lot easier, with Giovanni's Travel Kit. Contains convenient 2 oz. travel sizes: Tea Tree Triple Treat Invigorating Shampoo and Conditioner to stimulate, condition and calm all hair types; and Cucumber Song Body Wash and Lotion to infuse skin with hydration for all skin types. Packed in a reusable and resealable bag. TSA compliant! 4 pc. ORDER NOW! • Flight Attendant First Class Travel Kit Smooth As Silk & Grapefruit Sky: Beauty and hygiene on the go for head to toe! Packing just got a whole lot easier, with Giovanni's Travel Kit. Contains convenient 2 oz. travel sizes: Smooth as Silk Deep Moisture Shampoo and Deeper Moisture Conditioner for manageable, smooth hair for all hair types; and Grapefruit Sky Body Wash and Lotion to infuse skin with hydration for all skin types. Packed in a reusable and resealable bag. TSA compliant! 4 pc. ORDER NOW! 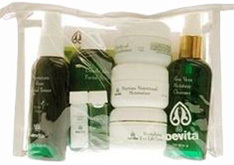 Flight Attendant First Class Travel Kit Tea Tree 4 pc. Flight Attendant First Class Travel Kit Smooth As Silk 4 pc. SETS & KITS: Flight Attendant First Class Travel Kit, 4 pc. • One Step At A Time Mini Tin Set: Original Fragrance is an exclusive blend of 8 essential oils that offers a light, fresh masculine scent. Citrus top notes of Bergamot, Lemon And Lime are layered over Geranium and Patchouli with base notes of Cedarwood, Artemisia Vulgaris and Vetiver. Perfect as a gift or for travel. 3 pc. ORDER NOW! One Step At A Time Mini Tin Set 3 pc. SETS & KITS: One Step At A Time Mini Tin Set, 3 pc. • Body Butter Triple Treat Kit: Relish this Triple Treat of Triple Butter Body Butters are enriched with a super hydrating blend of three natural plant butters - Cocoa Butter, Mango Butter, and Shea Butter. Each Triple Butter Body Butter moisturizes, heals, and protects the skin. An essential combination of tangy fruit and organic botanical extracts invigorates the senses. The rich, thick creaminess glides on smooth without being greasy. Massage generously all over the body for smooth, supple skin. 3 pc. ORDER NOW! -- 1 Orange Body Butter, 1.7 oz. -- 1 Mango Body Butter, 1.7 oz. -- 1 Lemon Body Butter, 1.7 oz. BODY BUTTER ORANGE INGREDIENTS: Water, [Aqua], Stearic Acid Isopsropyl Palmitate, Cetyl Alcohol, Cyclomethicone, Aloe Barbadensis Leaf Juice, Isopropyl Myristate, Theobroma Cacao [Cocoa] Seed Butter, Butyrospermum Parkii [Shea] Butter, Mangifera Indica [Mango] Seed Butter, Glycerin [Vegetable], Heliantus Annuus [Sunflower] Seed Oil, Citrus Aurantium Dulcis [Orange] Fruit Extract, Anthemis Nobilis [Chamomile] Extract, Lavendula Angusifolia [Lavender] Extract, Tocopheryl Acetate [Vitamin E], Xanthan Gum, Phenoxyethanol, Triethanolamine, Parfum, Polysorbater 80, Carbomer, Potassium Sorbate. BODY BUTTER MANGO INGREDIENTS: Water, [Aqua], Stearic Acid Isopsropyl Palmitate, Cetyl Alcohol, Cyclomethicone, Aloe Barbadensis Leaf Juice, Isopropyl Myristate, Theobroma Cacao [Cocoa] Seed Butter, Butyrospermum Parkii [Shea] Butter, Mangifera Indica [Mango] Seed Butter, Glycerin [Vegetable], Heliantus Annuus [Sunflower] Seed Oil, Mangifera Indica (Mango) Fruit Extract, Anthemis Nobilis [Chamomile] Extract, Lavendula Angusifolia [Lavender] Extract, Tocopheryl Acetate [Vitamin E], Xanthan Gum, Phenoxyethanol, Triethanolamine, Parfum, Polysorbate 80, Carbomer, Potassium Sorbate. BODY BUTTER ORANGE INGREDIENTS: Water, [Aqua], Stearic Acid Isopsropyl Palmitate, Cetyl Alcohol, Cyclomethicone, Aloe Barbadensis Leaf Juice, Isopropyl Myristate, Theobromacacao [Cocoa] Seed Butter, Butyrospermum Parkii [Shea] Butter, Mangifera Indica [Mango] Seed Butter, Glucerin [Vegetable], Heliantus Annuus [Sunflower] Seed Oil, Citrus Medica Limonum (Lemon) Peel Extract, Anthemis Nobilis [Chamomile] Extract, Lavendula Angusifolia [Lavender] Extract, Tocopheryl Acetate [Vitamin E], Xanthan Gum, Phenoxyethanol, Triethanolamine, Parfum, Polysorbate 80, Carbomer, Potassium Sorbate.. Body Butter Triple Treat Kit 3 pc. SETS & KITS: Body Butter Triple Treat Kit, 3 pc. 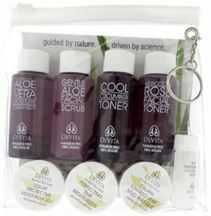 • Deluxe Travel Pack: This is a great way to take your Devita products along with you on a quick trip. A great gift idea as well as a perfect way to sample all eight (8) of our most purchased daily care products. A Perfect way to Sample! Kit comes with complete usage guide and a Devita clear spa-quality vinyl tote. 8 pc. ORDER TODAY! 1 Aloe Vera Moisture Cleanser: This lightweight, refreshing, all natural face wash helps remove dirt, dissolving make-up, impurities, and pollutants, and leaves the skin feeling hydrated and supple, not stripped or squeaky. 2 oz. 1 Moroccan Rose Facial Toner: Helps promote the feeling of smoother, fresher-looking skin, and control and calm any visible appearance of redness and reactivity. 2 oz. 1 Gentle Aloe Facial Scrub: Gently erase off old, dead, and dry surface cells and leaves skin feeling smooth and soft, as the appearance of healthy, new skin turn-over is encouraged. 2 oz. 1 Daily Solar Protective Moisturizer 30: Light rich cream leaves skin nourished and feeling soft and smooth, and normalize all skin types. 0.5 oz. 1 Evening Nutritional Moisturizer: Help replenish and condition the skin overnight. 0.5 oz. 1 Optimal Rejuvenation: With face, eye, and neck area appearing firmer, and the look of fine lines and wrinkles are to revitalize and restore that firm feel and youthful glow. 0.125 oz. 1 17% Devita C: Helps the appearance of skin's tone and elasticity, softening the look of fine lines and wrinkles, as a result your skin can appear revitalized and have a visibly enhanced look in just a few short days. 0.125 oz. 1 Revitalizing Eye Lift Creme: This soothing, smoothing creme serum will help reduce the look of puffiness and dark circles, and gentle on the delicate muscles and tissues surrounding your eyes. 0.5 oz. • Try Me Kit Anti Aging: Try-Me Kit Anti-Aging is a simple, clean skin care line that truly works. Most people see a positive improvement in 7-10 days. The products are very versatile and supportive , and that's just what makes the kits so special for any skin type! A Perfect way to Sample! 9 pc. ORDER TODAY! -- 1 Aloe Vera Moisture Cleanser: This lightweight, refreshing, all natural face wash helps remove dirt, dissolving make-up, impurities, and pollutants, and leaves the skin feeling hydrated and supple, not stripped or squeaky. 1 oz. -- 1 Moroccan Rose Facial Toner: Helps promote the feeling of smoother, fresher-looking skin, and control and calm any visible appearance of redness and reactivity. 1 oz. -- 1 Cool Cucumber Facial Toner: A uniquely relaxing, yet exhilarating, all-natural skin toner will become an addiction! Helps promote the feeling of smoother and fresher-looking skin, and control and calm any visible appearance of redness and reactivity. 1 oz. -- 1 Gentle Aloe Facial Scrub: Gently erase off old, dead, and dry surface cells and leaves skin feeling smooth and soft, as the appearance of healthy, new skin turn-over is encouraged. 1 oz. -- 1 Daily Solar Protective Moisturizer 30: Light rich cream leaves skin nourished and feeling soft and smooth, and normalize all skin types. 1 oz. -- 1 Evening Rich Nutritional Moisturizer: Help replenish and condition the skin overnight. 1/4 oz. -- 1 Perfecting Time Moisturizer: Helps reduce the wrinkle-formation mechanism and the appearance of deeper wrinkles leaving the skin nourished and feeling soft and smooth. 1/4 oz. -- 1 Optimal Rejuvenation: With face, eye, and neck area appearing firmer, and the look of fine lines and wrinkles are to revitalize and restore that firm feel and youthful glow. 1/4 oz. -- 1 Hyaluronic SeruGel: Helps contribute to the skin's elasticity and suppleness, minimizes the look of lines and wrinkles, and helps to prevent premature signs of aging, soften facial lines, and nourish collagen. 1/8 oz. • Try Me Kit Oily/Acne: packed with the regimen designed for the individual desiring to try Devita Natural Skin Care products for their specific skin type. Packaged in a handy key ring tote. A Perfect way to sample and as always all ingredients are Paraben-Free and Vegan Approved! 9 pc. ORDER TODAY! -- 1 High Performance AHA: Provides the appearance of smoother, younger looking skin, reduced pore size, and gives a blushed, healthy glow, minimize break-outs, reduces the appearance of fine lines, deeper wrinkles, and darkened areas on the face. 1/8 oz. -- 1 DeVita-C Vitamin: Helps the appearance of skin's tone and elasticity, softening the look of fine lines and wrinkles, as a result your skin can appear revitalized and have a visibly enhanced look in just a few short days. 1/8 oz. -- 1 Daily Solar Protective Moisturizer 30: Light rich cream leaves skin nourished and feeling soft and smooth, and normalize all skin types. 1/4 oz. -- 1 Perfecting Time Moisturizer: Helps reduce the wrinkle-formation mechanism and the appearance of deeper wrinkles, leaving the skin nourished and feeling soft and smooth. 1/4 oz. -- 1 Italian Tomato Leaf Mud Masque: An intense detoxifying and cleansing masque designed to purge impurities and bring increased circulation to the surface of the skin. 1 oz. -- 1 Cool Cucumber Facial Toner: Helps promote the feeling of smoother and fresher-looking skin, and control and calm any visible appearance of redness and reactivity. Deluxe Travel Pack, 8 pc. Try Me Kit Anti Aging, 9 pc. Try Me Kit Oily Acne, 9 pc. SETS & KITS: Deluxe Travel Pack, 8 pc. SETS & KITS: Try Me Kit Anti-Aging, 9 pc. SETS & KITS: Try Me Kit Oily Acne, 9 pc. • 2-Step Home Alpha Beta Peel Kit: DeVita 2-Step Alpha Beta Home Peel Kit helps exfoliate your skin, removing the outer layer of dull dry skin to show your new healthy skin. The peel evens out your skin tone, reduce the appearance of fine lines, give you a healthy glow, diminish enlarged pores, and improve the overall texture of your skin. Salicylic acid from White Willow Bark and Glycolic Acid from sugarcane can be effective on acne. Helps promote the peeling of the top layer of skin and the opening of plugged follicles, and regenerate the normal skin-cell replacement cycle. For milder acne, Salicylic Acid helps unclog pores to resolve and prevent lesions. Use as part of your weekly skin care. The peel has no down time and should be used weekly for maximum results. 100 percent Vegan and Paraben Free. Gluten Sensitive Safe and never contain GMO's. NOTE: Please make sure to tighten the lids on both jars as contents will evaporate. Should persistent redness occurs, decrease frequency of use. 2 pc. 2 oz. ORDER TODAY! Ingredients: Home Peel Step 1: Aloe Vera Gel, Witch Hazel Extract, Allantoin, Salicylic Acid, Chamimile Extract, Papin and Citric Acid. Home Peel Stip 2: Aloe Vera Gel, Chamomile Extract, Sodium Bicarbonate Potassium Sorbate. Active Ingredients: Salicylic Acid 5.0%, Alpha Hydroxy Acid. 10%. SETS & KITS: 2-Step Home Alpha Beta Peel Kit, 2 pc. • Outdoor Skin Protection Kit 6 pc: The safest, most effective skin care remedies are now available in an environmentally friendly, reusable hemp bag. All Terrain's Outdoor Skin Protection Kit is perfect for gift giving to everyone from the outdoor enthusiast to the mom on the go. 6 pc. ORDER NOW! -- Hand Sanitizer with Aloe & Vitamin E, 2 oz. -- Aloe Gel Skin Repai,r 2 oz. -- Herbal Armor Insect Repellent Pump Spray, 2 oz. -- Lip Armor SPF 25 Lip Protection, .15 oz. -- TerraSport Sunscreen SPF 30, 1 oz. -- Recovery Rub Pain Relieving Cream, 1 oz. 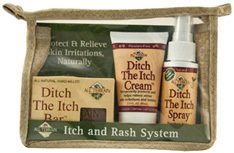 • Itch and Rash Solution System 3 pc: Protect and relieve skin irritations, naturally, with resealable Travel Bag. 3 pc. ORDER TODAY! -- Ditch The Itch Bar, 4.0 oz. -- Ditch The Itch Cream, 2.0 oz. -- Ditch The Itch Spray, 2.0 oz. • Poison Ivy and Oak Solution System 3 pk: Exclusively designed to naturally calm poison ivy, oak and sumac by cleansing, protecting and relieving. Dries oozing and weepingWhen used in combination, the Bar, Cream and Spray work extremely well. 3 pc. ORDER TODAY! Poison Ivy/Oak Bar, 4 oz. Poison Ivy/Oak Cream, 2 oz. Poison Ivy/Oak Spray, 2 oz. • First Aid Kit 17 pc: First aid essentials for an active lifestyle. 17 pc. ORDER TODAY! -- 1 Aloe Gel Skin Relief, 2 oz. -- 1 Antisepz Gel, .6 oz. Outdoor Skin Protection Kit 6 pc. Itch and Rash Solution System 3 pc. Poison Ivy and Oak Solution System 3 pc. First Aid Kit 17 pc. SETS & KITS: Outdoor Skin Protection Kit, 6 pc. Itch & Rash Solution System 3 pc. SETS & KITS: Poison Ivy and Oak Solution System 3 pc. SETS & KITS: First Aid Kit, 17 pc. 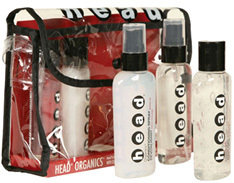 • HEAD Organics Travel Kit: Offers a collection of their most popular products in convenient carry along sizes. Perfect for travel, for presents, or to take to the gym. 5 pc. ORDER TODAY! -- 1 Clearly HEAD Shampoo: Cleanses thoroughly and gently and is safe enough for daily use, promoting shine and manageability. A new clearly pure formula. 2 oz. -- 1 Clearly HEAD Conditioner: Curly, course, thin, thick, or unruly hair? Head Organics Conditioner is ideal for all hair types. Fortified with pro-vitamin B5, aloe vera and soy protein for maximum moisturizing benefit without the weighing down, leaving hair softer and more manageable. Gentle enough for daily use. Safe on color-treated and permed hair. 2 oz. -- 1 HEAD Leave-In Conditioner: A nutritious moisturizing mist for healthier looking and softer feeling hair. 2 oz. -- 1 HEAD Extra Hold Hair Gel: Hold your favorite do while adding volume and texture. 2 oz. -- 1 HEAD Extra Hold Hair Spray: A light moisturizing mist with maximum, all-day hold minus the stickiness! 2 oz. SETS & KITS: HEAD Organics Travel Kit, 5 pc. 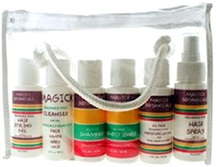 • Fragrance Free Travel Kit: Includes Magick Botanicals Fragrance Free Hair Spray Oil Free, Fragrance Free Moisture Lotion Oil Free, Fragrance Free Shampoo Oil Free, Fragrance Free Conditioner, Fragrance Free Cleanser, and Fragrance Free Styling Gel in a zippered clear plastic case with rope handles. Perfect for travel, for presents, or to take to the gym. 6 pc. ORDER TODAY! -- Fragrance Free Hair Spray, 2 oz. -- Fragrance Free Oil Free Moisture Lotion, 2 oz. -- Fragrance Free Oil Free Shampoo, 2 oz. -- Fragrance Free Oil Free Conditioner, 2 oz. -- Fragrance Free Cleanser, 2 oz. Fragrance Free Styling Gel, 2 oz. Fragrance Free Travel Kit 6 pc. 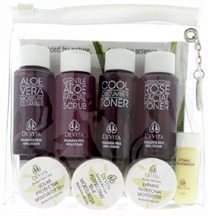 SETS & KITS: Fragrance Free Travel Kit, 6 pc.